Exploring the early CD catalog of the French independent label Accord. This is a compilation of tracks from various dates and origins and Accord is very uninformative about what exactly those sources are, giving only recording dates of 1954, 1956, 1961 and 1963. 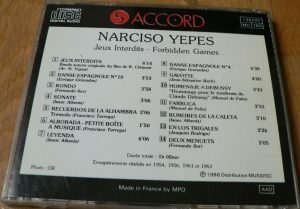 Apparently the recordings fell into Accord’s copyright bag through the LP label Festival / Musidisc, but they had origins further back, presumably in French Decca. Festival / Musidisc FLD 718, had, in addition to the famous music for René Clément’s film “Jeux Interdits” (“Forbidden Games”), the classical stuff, Sor’s Rondo and Two Menuettos and Bach’s Gavotte from the Violin Partita No. 3 (tracks 1, 3, 9 14), together with works of Rameau, Scarlatti, Sanz, Milàn. 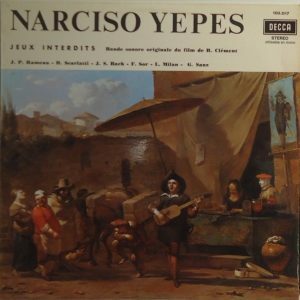 Note that what is played is not just the popular and short (1’50) anonymous “Romance” that Yepes once claimed was his own composition, but also, as published in 1962 on 45rpm Decca 79.548 or Decca 84.124 (link will open a new tab to listing on Discogs.com), Yepes’ arrangements of Robert de Visée’s Sarabande and Bourrée and of an anonymous Catalan Song, “The Testament of Amelia”. Same program as Festival’s was on French Decca 105.017, 115.008 and various other Decca and Ace of Clubs editions. Nine out of the ten tracks of Spanish music (Albéniz, Tárrega, Falla, Rodrigo and Granados’ Spanish Dance No. 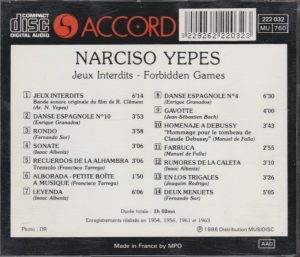 4, tracks 4-8 and 10-13) comprised the program of Festival / Musidisc FLD 752, “Musique espagnole pour guitare”, which had the same cover art as this Accord CD reissue (but I haven’t been able to find a suitable photo online, all those available at the time of writing are truncated). Contrary to what Accord indicates, the Sonata played on track 4 is not by Isaac Albéniz: it is an arrangement for guitar of the famous Sonata in D of Mateo Albéniz. I haven’t found a backcover photo of FLD 752 to check of the mistake came from them. Accord also calls Rodrigo “Joaquim”. No, it’s Joaquín. That leaves out only Granados’ Spanish Dance No. 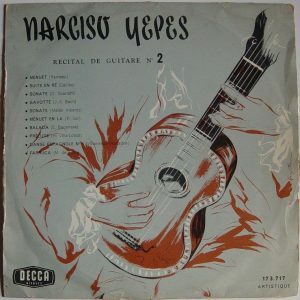 10 (track 2), but there were two early French Decca LPs, FST 133076 (see entry on Discogs.com), also found under label numbers FST 153.076 or 215.076 “Musique espagnole pour guitare du XVIe au XXe siècles“, and 173.717 or 215.717 “Récital de guitare No. 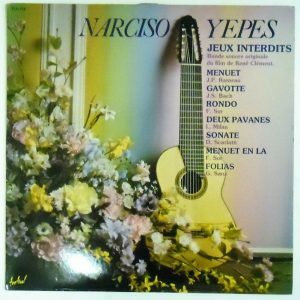 2” , which had all the tracks of those later LPs (including those not gathered on Accord, and with Matéo Albéniz duly credited on Récital de guitare No. 2) except for Jeux Interdits. 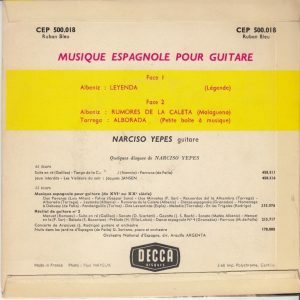 And these seem to point back to even earlier issues from Spanish Decca, as LXT 2974 “Musica Española Para Guitarra“, which Discogs.com dates from 1955, or CCL 38010 “Recital De Guitarra”, dated 1960. But differences in sonics on the Accord CD suggest that all those tracks had various origins, probably from 45 rmps, and were later compiled on those LPs. 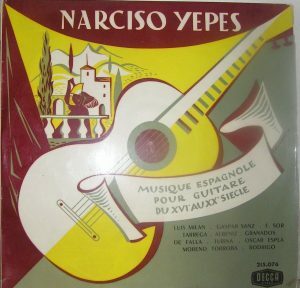 I’ve found one online, 45rpm Decca CEP 500.018, “Musique espagnole pour guitare”, with Albeniz’ Leyenda (track 7) and Rumores de la Caleta (track 12) and Tárrega’s Alborada (track 6), although I can’t vouch that there are indeed the recordings that actually found their way onto the Accord CD, and I wouldn’t absolutely stake my hand that the three Accord tracks were recorded at the same session, with same microphone placement. Not that those minutiae matters all that much. In the Accord reissue, all the tracks sound good, with limited tape hiss and guitar sounding full and present, and the solo guitar is an instrument that doesn’t absolutely require stereo anyway; in fact, I can’t tell which tracks are in mono, although recordings made in 1954 and 1956 imply that some of those tracks are mono indeed. 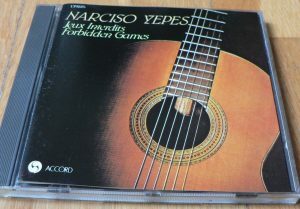 The author of the guitar arrangements of the piano pieces of Granados and the two Albéniz, and of Falla’s Farruca (Dance of the Miller) from the ballet The Tri-Cornered Hat, is not credited – they are great, they make it sound as if the music had been originally composed for the guitar, then transcribed for piano or orchestra, which is exactly the right spirit. For the record, the piece of Albéniz known as Leyenda is the prelude of Chants d’espagne op. 232 (posthumously included under the title “Asturias (Leyenda)” in the First Suite española op. 47 – see Wikipedia for the details on this and eternal gratitude to Jimmy Wales again); the other one, Rumores de la Caleta, comes from the cycle Recuerdos de Viaje op. 72 (No. 6). 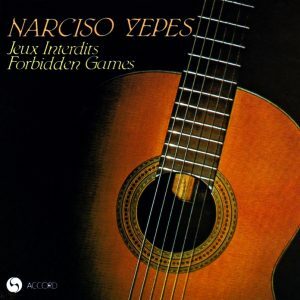 The CD is a good introduction to the art of Yepes and a good recital of guitar music. 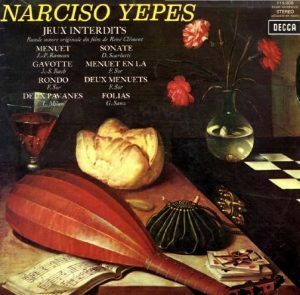 There is the inescapable Jeux Interdits, and a good mixture – good because slanted in favor of the Spanish –of the classical (Bach), the Romantic (Sor) and the Spanish (the rest). 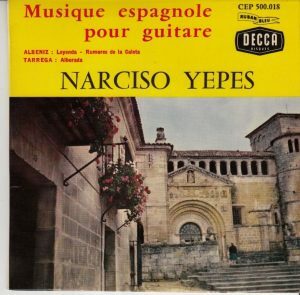 Many of the Spanish guitar warhorses are there, the Granados Dances, Falla’s Tombeau for Debussy and Miller’s Dance, Albeniz’ so-called “Leyenda” and Tárrega’s famous “Recollections of the Alhambra” aka “tremolo” piece. TT 57:26. Accord’s first CD edition was 139225 and it came without barcode, which makes it more difficult to find on your customary online record shop (it seems listed on the various Amazons under barcode 723722160523, probably a distributor’s barcode). It was then reissued as 222 032, barccode 3229262220323, which is the one I have. Photos for the original issue are those of a current eBay offer.